There are a few loose ends that will probably never be tidied up, but having it mounted to the wall gets it out of the way. To make things easier the equipment is mounted to a scrap board, then the board is attached to the wall. 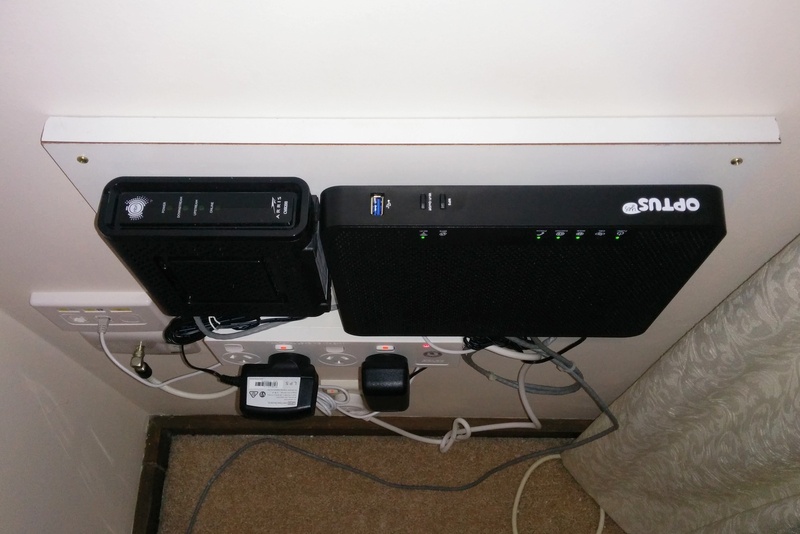 The black box at the top left is the NBN provided Arris cable modem and the larger black box to the right is the Optus provided “modem” which is really the router, wireless access point and VoIP adapter. The RJ11 socket on the wall is how the VoIP adapter connects to the existing phones throughout the house. The latet development is that I received a letter, specifially a “Notice of hybrid fibre coaxial (HFC) installation” saying that their “construction partner intends to install nbn supplied equipment at your property between 26/09/2017 and 23/04/2018.” Apart from not liking the six month window, the information was quite good with a brochure explaining the types of installation (aerial vs underground) and that there would be an NBN utility box. It seems like something if finally happening, so it is time to properly research plans.